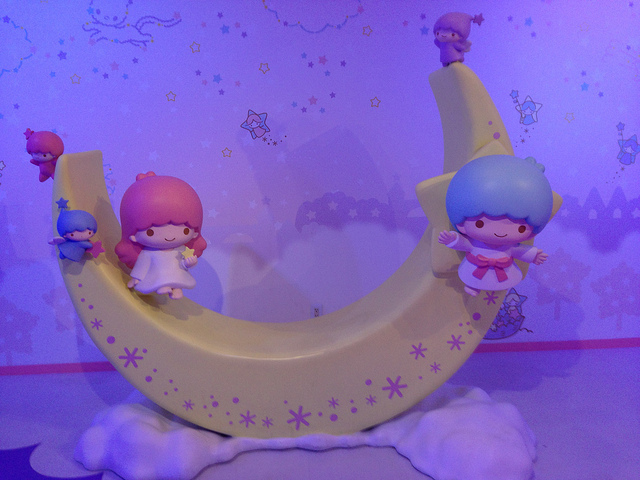 Hello Kitty and My Melody are probably the major globally well-known characters of Sanrio, but we cannot forget about Little Twin Stars. Colours used for the character consists of less bold colours, but I like the use of softer milky colour in the character. Now, there is a Little Twin Stars themed café opened in Tokyo from March this year. So, what this café makes Little Twin Stars themed is not just the fact that this place is selling original Little Twin Stars goods such as tote bag and key rings, but serving cute food using the characters as a motif. Food served includes burgers and fluffy star-shaped pancakes, and you can take paper place mat home. Also, if you order drinks, it will come with character coaster which again you can take home! Coasters actually have 5 types, so fans would definitely be interested to collect all?? Anyway, I found a documentary movie on youtube, so please have a look how it looks like! You could turn around and say food just have got star-shaped ingredients, but see how it makes all food look cute (*’u’*) I like the fact that the article kindly suggest that taking mat and coaster is OK otherwise people have to feel guilty of taking them out of shop 😉 Fans, if you are coming to Tokyo when it’s open, please visit the cafe in Shibuya Parco! Please let me know what you think^^ I’m looking forward to hearing from you!